Environmentally friendly cleaning refers to using cleaning methods and chemical with eco-friendly ingredients and procedures that are designed to preserve human health and environmental quality. Environmentally safe chemicals avoid using products that contain toxic chemicals, some of which emit volatile organic compounds causing human health concerns such as respiratory, dermatological and other conditions. Environmentally friendly cleaning products also refers to how a company disposes of such chemicals; mainly including wastewater. At Phoenix Clean, the chemicals used are eco-friendly and biodegradable. Cleaning Agents are substances used to remove dirt, dust, stains, grease, and smells; usually seen in liquids, powders, sprays, or granules. Cleaning agents improve human health, improve a home’s curb appeal, remove offensive odor and stains, and avoid the spread and contamination of dirt all while eliminating bacteria. Acidic cleaning agents are mainly used for removal of inorganic deposits. At Phoenix Clean, we use an acidic cleaner to remove both battery acid and rust stains. This includes the entire spectrum of the rust family: thin, thick, topical, embedded, and fertilizer staining. This concentrated formula locks into concrete, and reverses 80-100% of the orange staining and restores concrete to its natural color. It is biodegradable, non-abrasive, and non-flammable. We use this form of acidic cleaner because it is safer to people and plants than hydrochloric acid. Phoenix Clean uses a high quality chlorine enhancer, surfactant, and scent cover. Designed with practical and efficiency in mind, our methods can reinforce bleach washes, as well as aid in cleaning power and effectiveness. It also includes a scent cover. Phoenix Clean uses a high-quality foaming agent and scent cover designed to help cleaning solutions cling to the target surface. Alkyl Polyglycosides (APS) is a class of non-ionic surfactants widely used in a variety of household and industrial applications. APGs enhance the formation of foams in detergents for common household cleaning methods to prevent run off and improve its efficiency. In addition to their foaming properties, APGs are also biodegradable. Phoenix Clean uses a heavy-duty degreaser for pressure washing tough spots or stains that cannot be effectively treated with Sodium Hypochlorite or Chlorine. Degreaser is mainly used on siding, roofs, decks, concrete, and any other exterior surface. Our degreaser is an effective, water-based, biodegradable product. 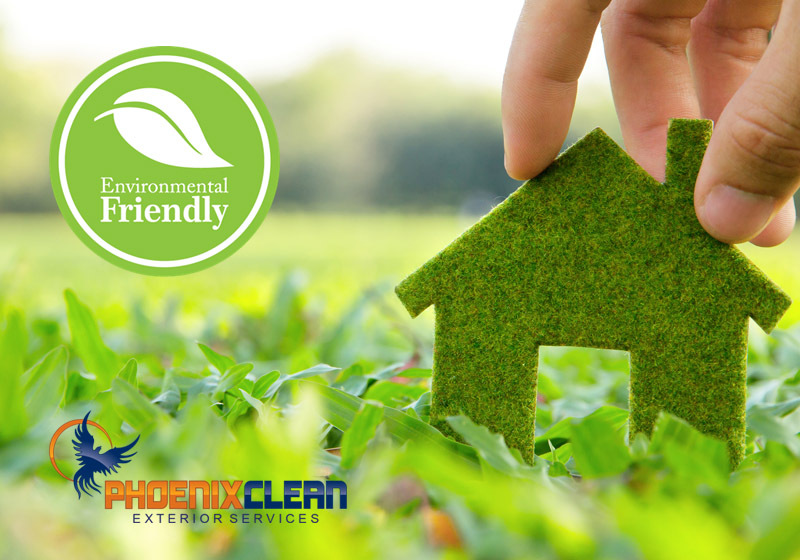 At Phoenix Clean, we are always aware of our environmental impact. We take measures to reclaim any grease or chemicals before they enter a storm drain, as well as always ensure the plant life in surrounding areas are not harmed. If you need further details on the chemicals we use, please give us a call and we would be happy to answer your questions!